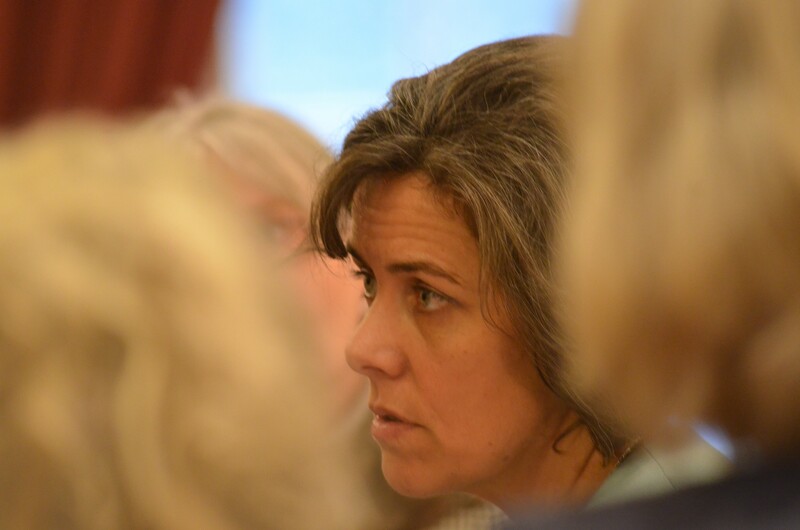 House Speaker Mitzi Johnson (D-South Hero), right, listens to colleagues during a conference to discuss an amendment. 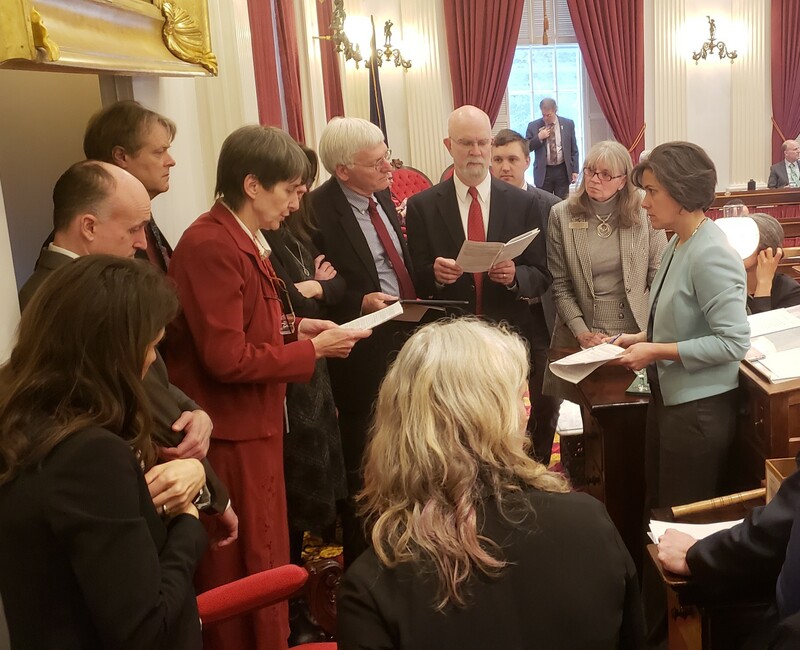 The Vermont House passed a landmark bill Thursday to enshrine abortion rights into state law, rejecting another flurry of last-minute efforts by Republicans to restrict or limit access to the procedure. By a vote of 106 to 37, the House passed H.57 after six proposed amendments failed. Many of them were similar to measures that either were shot down Wednesday or had been previously rejected by House committees. In explaining his opposition, Rep. Brian Smith (R-Derby) noted that 12-year-old girls need parental permission to get a flu shot. “We’re about to give 12-year-olds the right to get an abortion, and I don’t think that’s right,” Smith said. The measure goes next to the Senate, where it will be subject to another series of public hearings and legislative debate. Supporters of H.57 say that abortion rights must be protected by law, given the possibility that the U.S. Supreme Court could overturn Roe v. Wade, the 1972 decision that established abortion rights. House Speaker Mitzi Johnson (D-South Hero) discusses an amendment with legislators. Thursday’s proceedings featured lengthy but respectful floor debate punctuated by roll call votes. 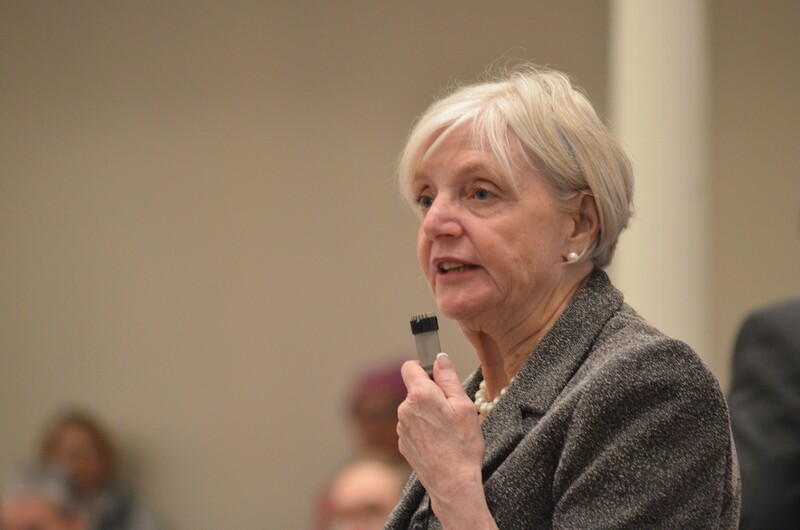 Rep. Anne Donahue (R-Northfield) proposed an amendment that would have required parental notification before minors can receive an abortion. The House voted down that and most of the other proposed amendments. “This is not about limiting access. This is about protecting children,” Donahue said. She noted the legislature has previously passed laws that treat minors differently than adults, such as age requirements for gun purchases. In rebuttal, Rep. Ann Pugh (D-South Burlington) noted that the House Committee on Human Services had voted 10-1 against a measure involving notification of a minor's parents. She argued that confidentially is vital to ensuring adolescent access to medical care. At one point during the debate, Donahue lamented the “degree of absolutism” on both sides, saying it was not suitable for such a complex, nuanced subject. Not every amendment made it to a debate in the House. In some cases, proposed amendments were rejected as not relevant to the underlying bill. That’s what happened when Rep. Robert Bancroft (R-Westford) proposed language prohibiting the sale of post-abortion fetal tissue. Bancroft later decried the bill as little more than a "platform for political grandstanding." Another failed amendment would have allowed unrestricted access to abortions up to 24 weeks into a pregnancy, but after that only if the fetus was not viable or to protect the mother’s health. Another would have required counseling before minors could receive an abortion.